Uncover the organized person within you. Believe it or not, we are all capable of living a more organized life. 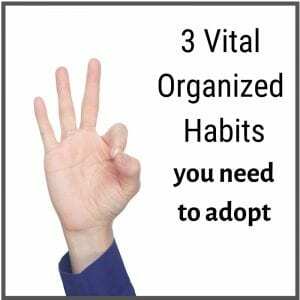 I’m going to reveal three vital organizing practices I teach my clients that may encourage you to embrace better habits. 1. Edit your possessions until they fit their intended space. When everything fits into your available storage spaces, shelving, garage, closets, drawers and cabinets you won’t have to invest in a larger home or rent an off-site storage unit. Counters, floors and spare rooms won’t be needed as supplementary storage areas. You’ll have room to prepare meals, reduce tripping hazards and be ready for last-minute visitors. As a bonus, it’ll be easier to put things away after using them. 2. Donate or discard more than ever as you declutter. This is especially true if you have a lot of things! As you replace older, worn items with new purchases, take a moment to place the older item into the trash, or if it’s in resalable condition, the donation container. 3. Swiftly, as if your life depends on it, put new items away after bringing them into your home. If they remain in their shopping bags, you’re likely to entirely forget about them. Having bags of purchases scattered throughout your home can make it seem like you have more clutter than you really do. Putting things away will also lessen the possibility of accidentally buying something you already have. Organization is a lifelong practice, one that requires continual attention as well as remembering why organization matters to you — in other words, the benefits. Which of the three practices will you embrace this week?